Have Fun With The Olympics in Your Classroom! Free Olympic Printables and More! I have created this page in honor of the 2006 Olympics and due to the large volume of requests from Teaching Heart Teachers who were looking for Olympic ideas to use in their classrooms. 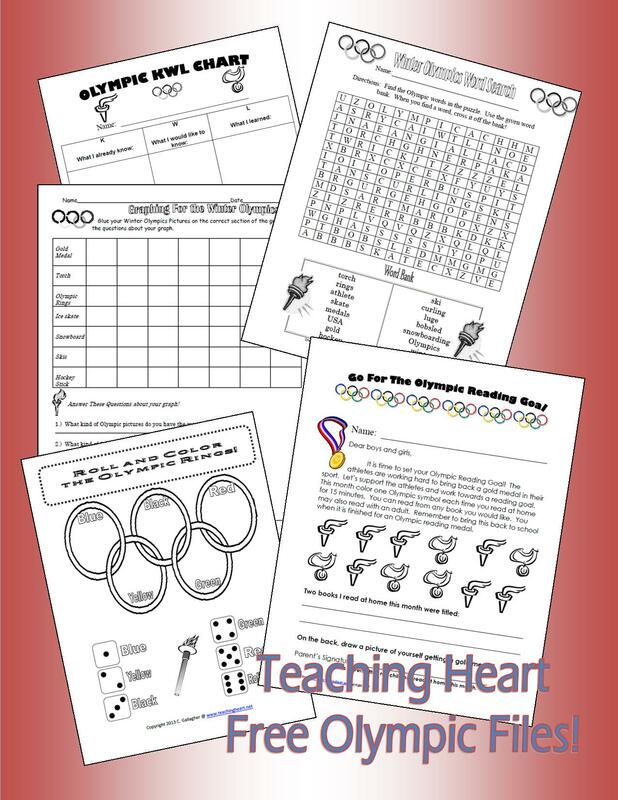 Below you will find ideas, printables, and great links that will help you create an Olympic Theme/Unit in your classroom. A special thanks to the teachers who sent me the great links to include on this page! -Before you begin your unit create a KWL chart of the Olympics with your class. Fill the chart in as you study the Olympics. I have included a student KWL chart below! Get black sheet paper and cover a bulletin board with it. Place a sports boarder around the board. On a computer generate a red, white, and blue sign with the title, "Going for the Gold in Room 1!" Make the Olympic Rings out of Oaktag. Make a Tourch and Flame out of oaktage. Purchase pretend medals at a party store. Make five smaller circles on a computer and place the words, writing, growing, learning, reading, and math in each circle. Place this all on a bulletin board! More Awesome Printables From Teaching Heart! - Make bar graphs for the gold, silver and bronze medals won for each country. You could also graph students favorite Olympic Sport. -Have students write a speech about winning the gold medal. -Brainstorm ideas of what it takes to be an Olympic Athlete. Students list and illustrate the ideas. -Put the sports names in ABC order. -Take a picture of each students head. Have the student cut out their head and then draw the body of what sport they would like to compete in. Make sure they include an Olympic background behind their drawing. Below the drawing you could have student write about their time at the Olympics. -Make Olympic Torches your students can eat... Use a sugar cone and whip cream. Sprinkle yellow sprinkles on the whip cream and you have torch the students can eat. Great to send home for the month of the Olympics! Click Here for the Dice Game! Our Pins!